Some good size fields for this years Joules Cross. The masters classes roll off the start on Saturday above. Results from the day's racing - Joules Cross Saturday Results. Some pictures of the Masters, Single Speed and Cat 4/5 - Joules Cross Pictures. A new trend in local Kansas cycling races - No stakes just mowed fields. Paul Aldeguer and Doug Stone climb along one of the many mowed paths that made up the course. 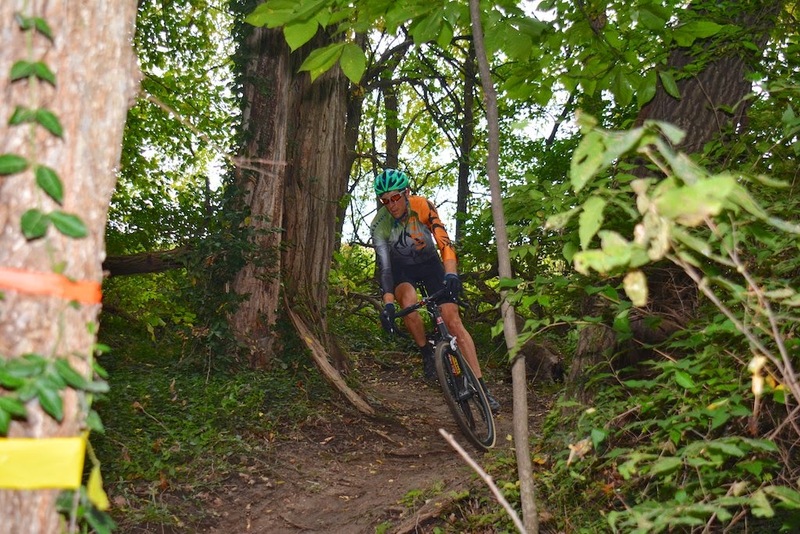 The field that was used for the event featured plenty of climbing and one short mud section. David Wathen leads Kevin Collins out of the "Mud Hole". Looks like beards are coming back for cross. Time to bring back the Chops if you ask me. Bill Anderson has the coolest bikes and always has a smile on his face. No matter the weather or if he is suffering Bill has a smile. Above Bill rides around the mud (a reason you need to stake a course and not just mow it ) because he did not want to get that sweet single speed rig of his dirty. Sadly the course featured only one short mud hole. Scott Stevens makes short work of it and continues on one of the many climbs. Beware of creepy crawly things out in Kansas. Doug Stone raced both days with a great showing on Sunday. Doug continues to lead the Kansas Best All Around Rider in the Masters 40+ division. It is a long walk back to the pit. For some reason there were plenty of tire mishaps over the weekend. Maybe it was the rough field? Freshly mowed fields which leaves sharp pointy blades of thick grass which can puncture tires. Two sets of barriers on the day. One large and one small. Both required running them. Tige Lamb used his running skills to take home 3rd place in the Masers 40+ class. Above he passes Masters 65+ winner Steve Schweiker of Ethos Racing. A nice size Cat 4/5 field on Saturday - 52 riders. Plenty of passing on that first lap. Christopher Locke demonstrates how it is done on the first lap. A lap later the favor was returned has he faded to 38th place on the day. Tire failures were not that uncommon over the weekend. 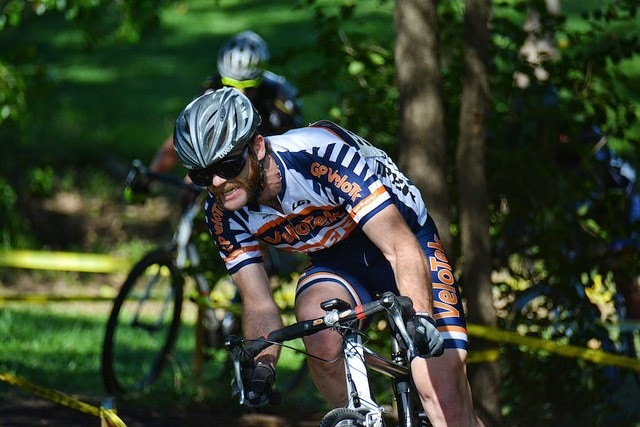 David Wathen had to take a bike change but climbed back to 12th place in a stacked Masters 40+ field. The motto "Build it and they will come" apparently works not only for baseball but for cyclocross. Mow a course in a field and you have yourself some Kansas Cyclocross. Above 2014 National MTB Champion Doug Long leads David Romisch and Chris Locke in the field of dreams. .
What to think of the "Twister" Shane Jones got dizzy from the "Twister" and ended up in 12th place in the Men's Cat 5 class. Team Horizon Cycling Team put on the Robidoux Roundup CX race Sunday. The course featured a nice flowing course with some sweet single track thrown in that connected the two fields to made up the 1.1 mile course. The climb of the day was even harder with the recent rains which lefte the course soft in areas. Many thought this course was the best designed so far this year. Hats off to the Jason Douglas, Randy Tracy and the rest of Team Horizon Cycling for having the event and putting so much work into the course. It really showed. Tire Pressure was on everyones mind. With the single track sections, a few roots and some slick mud finding the balance was key to success. 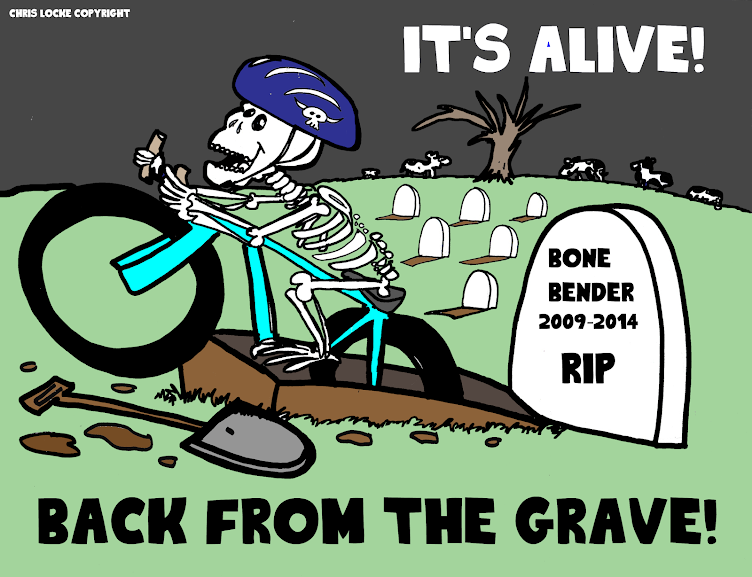 The Single Track sections were enjoyed by most riders. A pleasant change from the normal venues and lets hope we get more in the future. Riders with some mountain bike background did very well. Micah Gordon showed he has some roots off-road and took the win in the Men's Cat 1/2 class. JP Brocket who is no stranger to off-road racing had a strong showing taking 2nd place over Shadd Smith. The worlds tallest barriers were build especially for this event. Even taller riders had trouble. I could not imagine what shorter riders thought of them. Good times to be had out on course. Many riders were looking forward to the fun Robidoux course. What they were not looking forward to was those hills during the final laps. Course was fun but the climbing added up quickly. Midweek rains left the course a little slick in areas especially on the off camber downhills. Hit the right line and they are a joy. Wrong line and you are in for a wild ride. Christopher Locke demonstrates how to take the fast line. 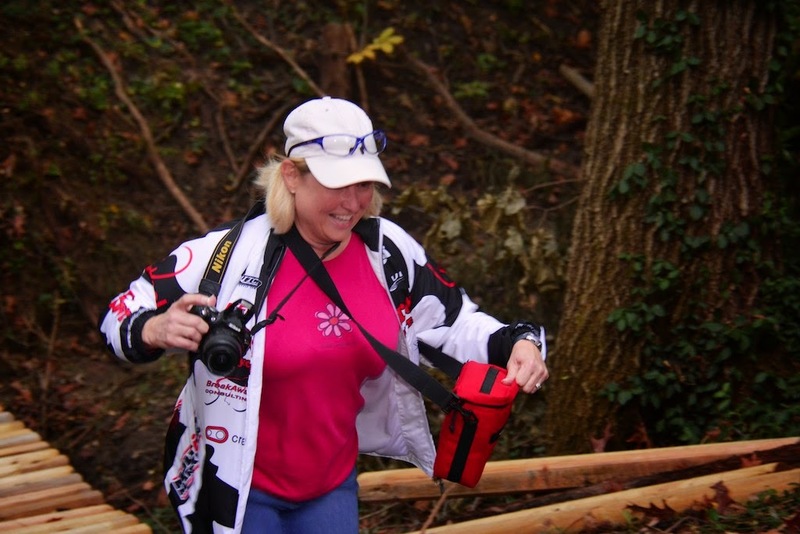 Carolynn Locke was out on course taking some fine photos along with Roger Harrison. Several of Rogers photos can be found in this report along side of Carolynn's. These two take hundreds of photos each week and we thank them for that. Action was fierce during the opening laps of many racers. Here David Wathen chases Galen Hansen of Epic Cycling. Tige Lamb in route to a win the Masters 40+ class. 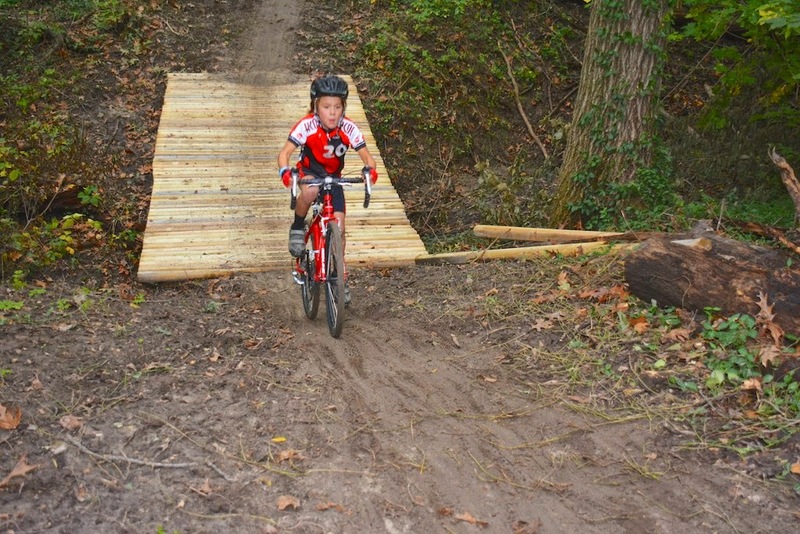 Not bad for his first cross race of the season. Doug Long in route to another Master's 60+ win. He caught many of the Masters 40+ and 50+ riders on his way to the top of the podium. 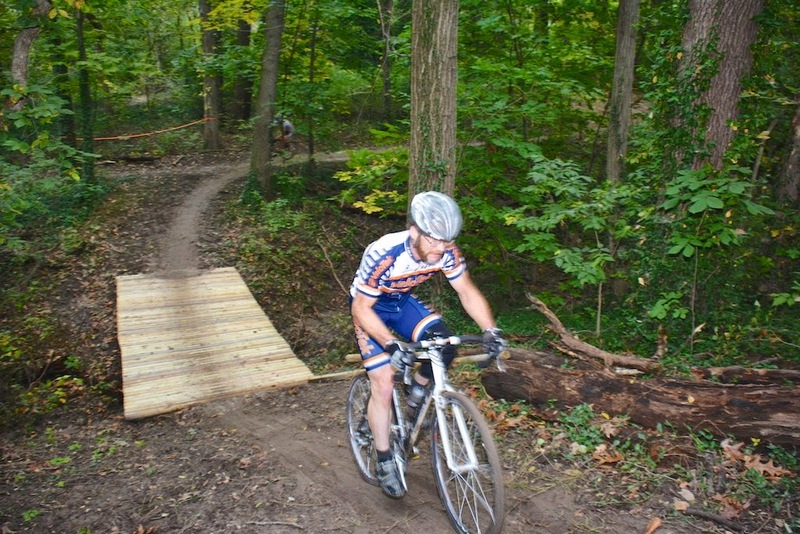 The only trouble out on course for Doug was those super tall barriers. Speaking of air. Some riders just use normal air from a floor pump, but Eric Burch uses helium in his tires to help float over the barriers. Tom Price ran away from the masters field winning the 50+ division and was the overall fastest master. John Williams and Chris Locke battle during the first few laps of the Master's class. John would earn 5th place on the day. 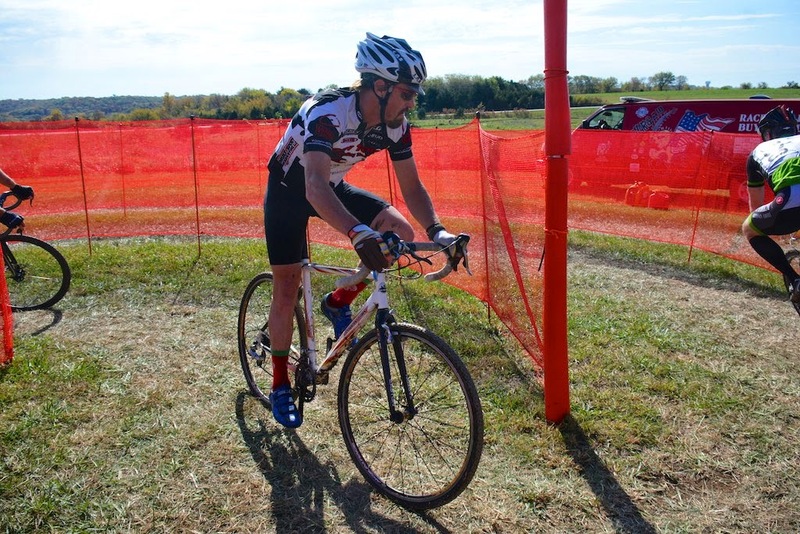 Cow Towns Tige Lamb earned his first cyclocross win of the season in the Men's Masters 40+ class. Paul Aldeguer of Big D Cycling worked his way up to 2nd place. Terry Higgins of 360 Racing was on the final step of the box. Ethos Racing's child prodigy Victoria Brocket won the Women's Junior class. 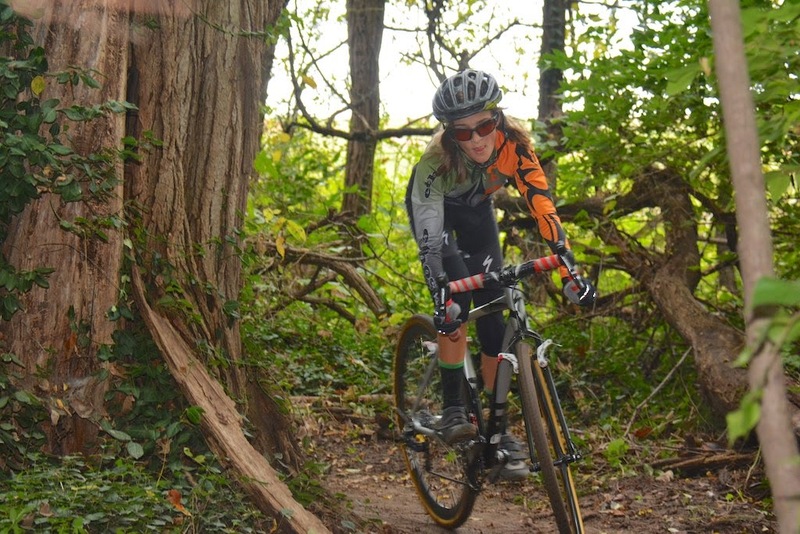 Victoria was one of those riders who excelled in the single track. Finn Smith of the KCOI U20 team and son of the one and only Shadd Smith earned 2nd place in the Junior class today. Finn has taken to cross just like his dad and even beat his result on this day. 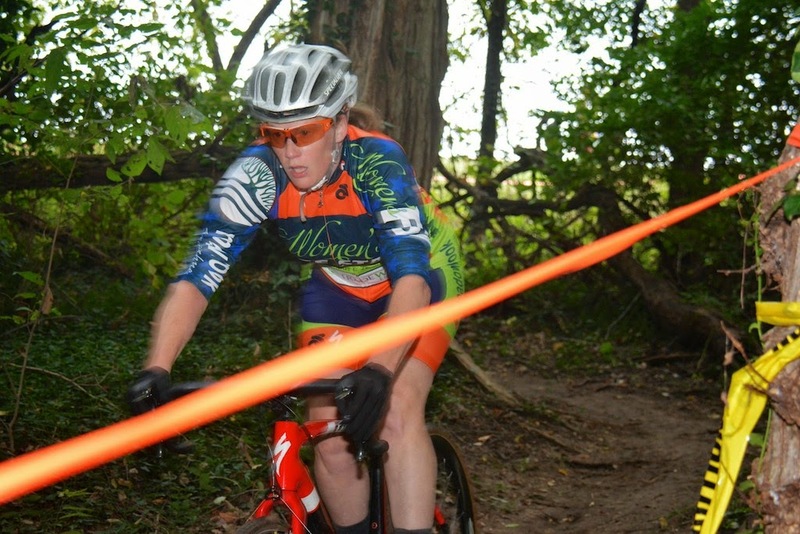 Team 360 brought us two days of fine racing in Lawrence, Kansas. Centennial Park was again the location for this years 360 Cup. This years course used the majority of the park and navigated around its 18 hole disk golf course. The course featured many tight switchbacks that lead to long straights and plenty of climbing. It was a power riders course for sure. Former national Collegiate Criterium champion Mark Smelser put on his game face to win the Men's Cat 3 race on Saturday for Team GP Velotek. Looks like it is chop growing season. Word on the street is that David Wathen is looking for a new mechanic after a chain mishap cost him dearly in the Men's Cat 3 race held on Saturday. 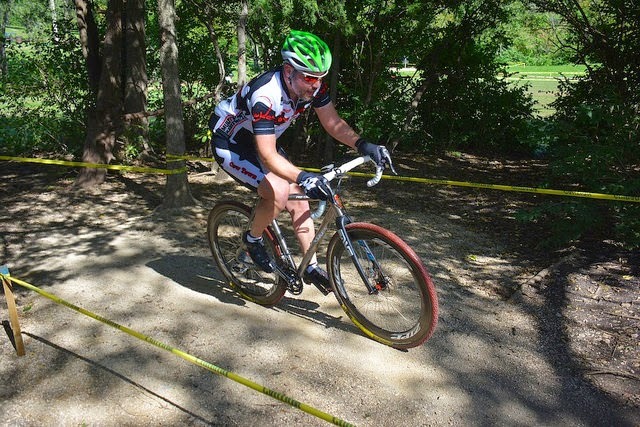 2014 National Mountain Bike Masters 60+ champion Doug Long proved his versatility as he took another win in the Masters 60+ class only this time in cyclocross. Heck, we do believe he could win the 50+ class if he entered that. Doug pulled double duty and helped his team with the event and raced. Our money is on Doug winning another championship come January. Chris Locke navigates around the medical staff in route to 9th in the Masters 40+ class. The course contained many tight switch backs that caused some riders troubles. "I never saw so many crashes in a cross race" said Locke. "It got me thinking about heading back to Hare Scrambles where it is safer and less rocky". Four time DK 200 winner Dan Hughes won the Men's Cat 4/5 class for the second time this season. 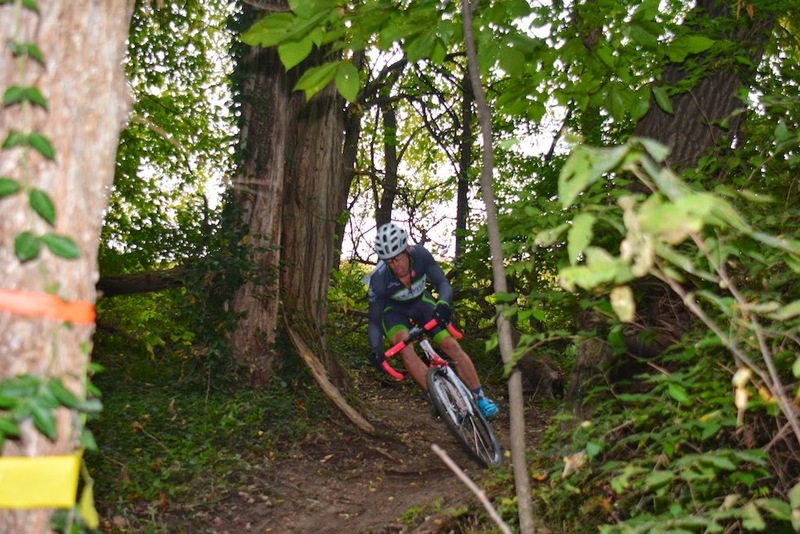 Usually a distance racer Dan is finding this cross stuff is no big deal and usually doubles up with two classes on a given Sunday. Doug Stone powered his way to another podium finish in the Men's Masters 40+ division. Here Doug is seen chasing eventual winner Rick Moseley. These two have been battling hard the last couple of races. Cow Town's Shane Jones who usually can be found riding his Single Speed mountain bike at local trails brought out his old trusty gravel rig and fought his way to 10th place in the competitive Men's Cat 4/5 class. Christopher Locke Jr. might have damaged his family jewels on this remount and finished off the pace in 21st place. "I think I might have to start training some and practice my dismounts before I hurt myself" said Locke. Not wanting to damage his "Jewels" Chris Locke Sr. decided to ride over the barriers in route to a 7th place finish during Sunday's Masters race.